In the current era, many businesses are building their own mobile apps to attract their targeted market and bring in more customers. Their main aim is to let the customers easily buy the products or offer profoundly customized services. In order to improve its customer experience, every business is going for the mobile app development to stand over its competitors. How much does it costs for mobile app development? The cost of developing a mobile app varies according to the app’s features, complexity, and the type of mobile app development you have chosen. According to a survey conducted by Clutch, a median price to create an app is $171,450. According to the online app cost calculators, an app with basic features costs between $10,000 and $50,000 whereas an app with dozens of features and functionality costs between $200,000 and $350,000. In general, the custom app development cost ranges from a total zero to unbelievably expensive price that could reach millions. This is one of the most common reasons behind the higher costs of iOS and Android app development. The Development Companies usually hire more than required developers for meeting the client’s requirements. However, if a careful analysis prior to the development process is done, the developer cost can be saved big time. Requirement Gathering is the first and the most important step towards any enterprise software development process. The development companies usually do not understand the customer’s requirement clearly and start developing the Mobile App. Moreover, they hire several Android as well as iOS app developers just to meet a requirement which could have been easily met by a single developer. Mobile development companies usually do not consult the user during the development phase. They tend to develop the entire app and then demonstrate it to the users. This not only takes away the customization option but also invites a huge cost requirement. Because the entire custom app development process will have to be done again if the customer isn’t satisfied with the demonstrated mobile app. 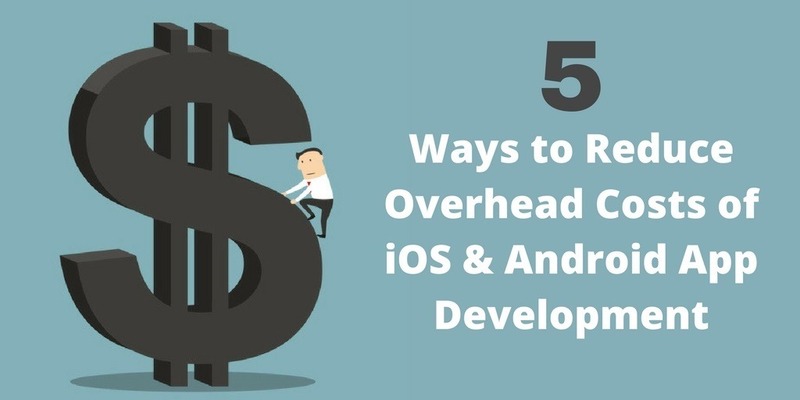 Now that you are aware of the factors responsible for the iOS and android app development cost, you might be wondering how we can reduce these costs? We’ve got a list of factors that can help you to control the mobile app development cost in order to help you achieve your business goals. Planning is a crucial factor that can affect your android and iPhone app development cost. Discuss the idea with the team and consider the user input as well. Initially, it is a great move to send out a user survey. Explore existing apps to see what are they are offering and what you do and don’t like about them. Planning will help you in analyzing how your app will be superior to those apps. Hence, this way you do not have to make an expensive proposition to add something new for your business during the development phase. Be clear about what all you need in your mobile app, and what are your expectations from your mobile app development agency. The main motive here is to be particular about your service and not offering too many features that will confuse the users. Not only will this save your money and time, but also it would turn out to be a more successful app. This is a prominent yet challenging way to reduce the app costing for Android and iPhone. With the sharing of cost, we mean both the business and developer can find a common way to share the expenses. The developer can request the investor for some funds where both of them can share the desired profit. Whereas the company with a limited budget can decide to fund the developer and can afterward gain full rights to the app. Pro Tip: Use open source app development frameworks to cut down the cost. You can simply look online for them and choose the one that fits the best for your project. For a customer who isn’t technically sound and still wants to have a Customizable and Hassle-free mobile app for his business, the Productized Mobile App Development looks the most profitable solution. This is one of the most cost-effective and efficient methods of getting your own business app and website done. It becomes easier for you to customize a pre-coded product that suits your business type and requirements. Since it is a productized solution, it has a quicker turn-around and has a myriad of contemporary feature options. Development Cost is very less. It’s a Fully Customizable Solution. Easy Drag and Drop Designing. Customize ‘n’ number of times. Usually, mobile apps are different and are built according to the requirements of the business. Still, there are some common elements like buttons, navigation, tabs and some more that you can keep the same. Also, one of the reasons for it is the basic expectations of users regarding using the mobile apps. The users, as well as the app stores, expect mobile apps to behave in a certain way. For example, iOS apps need to follow some Human Interface guidelines that Apple has created for them in order to get features in iTunes. Hence, you need not waste your time and money to create new elements and buttons and use already existing ones. This will definitely reduce your iPhone app development cost. Of course, customizing your app is always a good idea, but you need to draw the line whenever it is not required. Reducing development costs is not difficult. Just by keeping some basic things in mind. Such as removing the non-essential features, giving feedback and outsourcing you can cut down the costs. Also, the customers and the development companies both are required to make a thorough analysis of what exactly is required. Once the requirement is clear, it gets very easier for the mobile app development companies in India to hire developers as per the requirement which will result in lower labor cost. All in all, you will see that there is a lot of money and time that can be saved with just some planning ahead. To know about the latest trends in mobile app development, you can read our blog. If you are searching for a company with profound experience in mobile app development services yet offering genuine prices, your search stops at Signity Solutions!